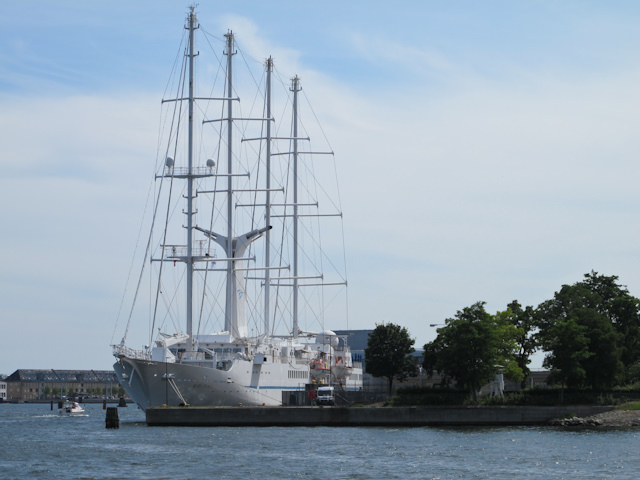 The 5,350-ton, 148-guest Wind Spirit and her identical twin, Wind Star, were Windstar’s original vessels (launched in 1988 and 1986, respectively), and they’re still some of the most romantic small ships at sea — part sailing yacht, part premium cruise ship, and with all the fine service, casual atmosphere, and excellent cuisine for which Windstar is known. In all, there are only four main public rooms: the Skylight Main Lounge and next-door Casino, the Restaurant, and the Veranda buffet restaurant. The Main Lounge is the spot for dancing, cocktails, and port talks, plus gambling in the casino, which is located in a small adjoining room. There’s also a second, open-air bar out by the pool, which is also the venue for Candles, a poolside steak and shish kabob restaurant that can serve about 30 guests per evening. 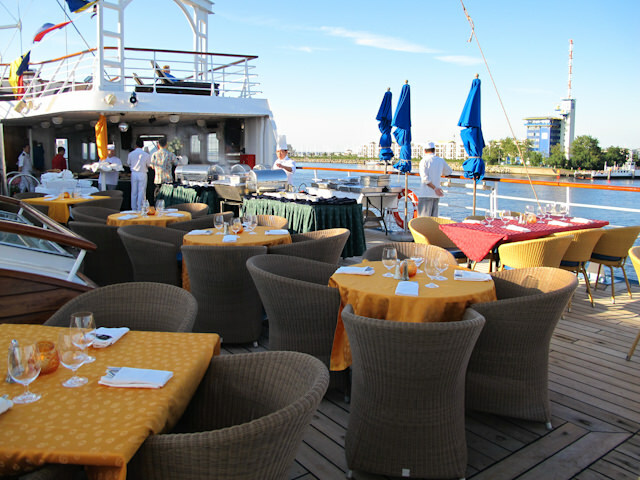 Otherwise, guests take their dinner at the spacious, nautically-styled main Restaurant. Breakfast and lunch are served at the Veranda, a sunny, big-windowed room with indoor and outdoor seating. Other rooms on board include a small spa, an equally small gym, and a cozy library where guests can surf the web or check out books, DVDs, and CDs for use in their staterooms. Outdoors there’s a small pool and hot tub, plus various decks and nooks appointed with deck chairs. Wind Spirit offers two basic accommodation choices: standard outside staterooms and Owners Cabins. 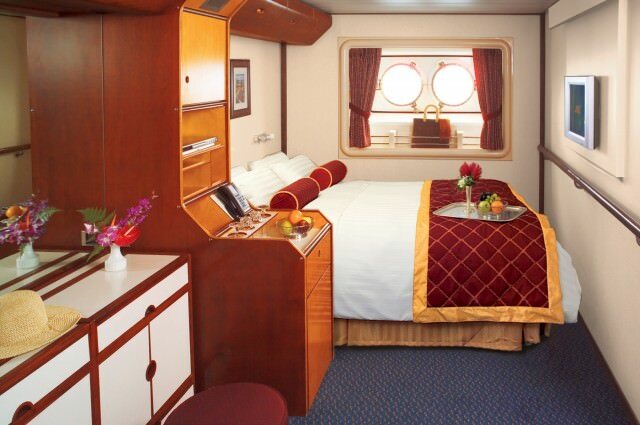 Each standard, 188-square-foot stateroom offers a queen-size bed, TV, DVD/CD player, Bose SoundDock (for use with iPods, your own or one you check out onboard), wi-fi, a small refrigerator, L’Occitane toiletries, adequate storage, and nicely designed bathrooms with granite countertops and teak floors. Owners Cabins offer a bit more space, measuring in at 220 square feet. Note that no accommodations on Wind Spirit offer balconies: Instead, all staterooms have traditional porthole windows. 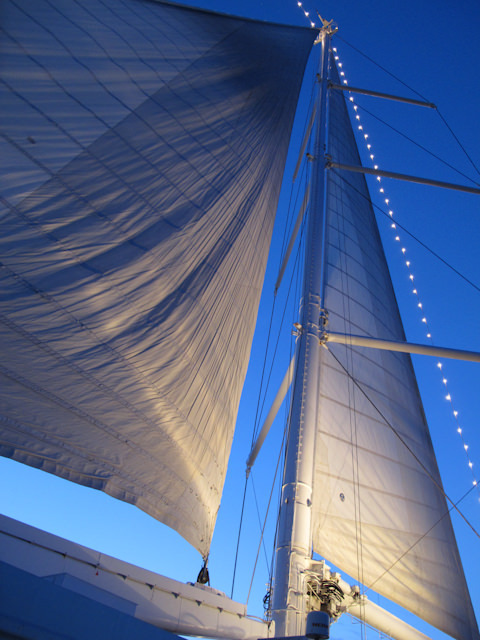 As part of renovations planned for April 2012, Wind Spirit will be getting an updated decor, with accommodations receiving leather headboards, linen wall coverings, wool carpeting, and new armchairs, art work, lighting features, window coverings, bed cushions, and throws. 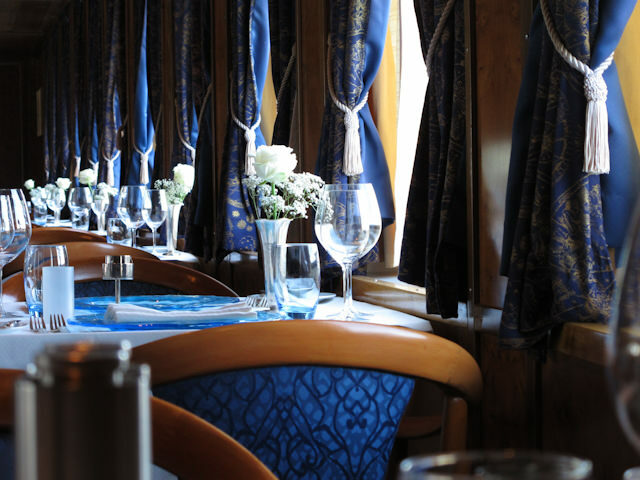 The ship’s public rooms will also get a makeover, adding a more contemporary look. But make no mistake: this is one comfortable, extremely well-kept ship.